This book is a real gem, a combination of Ellen Stimson's characteristic memoir and humor, with much-expanded recipe sections throughout. This time we are treated to a sweet, inviting sharing of family and Vermont Christmas holiday traditions. I most enjoyed several pictures of Stimson Christmas tree ornaments and accompanying memories. The food recipes stimulated the urge to get out the pots and pans immediately. We're even treated to a picture of the entire family. This is a book to read and enjoy, but also to keep around, to use and to cherish. Stimson does make a good point when she gently mentions events that have happened earlier than the scope of this book, and that the reader may find more detail in her previous titles. The fact is, where this offering is warm and homey, the earlier ones are hilarious...and homey. Buy the Christmas book as a gift for someone you like, or a set of all the books for someone you really, really like...or even yourself! Get to know Ellen and her quirky brood and who knows, you may find yourself looking at the mountains and heading off to Vermont when the first snow flies. At some point in our lives, haven’t we all wished for an old-fashioned Christmas? Ellen Stimson delivers the real thing to you in the form of wonderful stories of how her family “does” Christmas. She currently lives in a beautiful old house off the beaten track in Vermont. Stunning photographs of her home could compete with Currier & Ives when it comes to snowy Christmas scenes. This book is a compilation of delightful vignettes about Christmas in the life of her family and one of the best parts are the ravishing recipes which have been passed down from generations. Not just your typical Christmas sweet goodies but delicious main course meals such as Root Beer Pulled Pork and Corn Pudding. All of the essential Christmas elements are wrapped up in this book including glorious photographs of nature, Ellen’s home, delicious meals and goodies, towering Christmas trees blazing with lights in old-fashioned rooms, piles of gifts and even pictures of favorite ornaments, some scratched up over time but much-loved. Transport yourself back in time and curl up with this book now—it will give you some great ideas for your own Christmas this year! Bringing you closer to the food through warmth of words and ingredients. Enjoy every page as you read the stories and pick your first recipe to share any time of year. Ellen Stimson will reach your tummy with love on each page. Part memoir, part cookbook, An Old-Fashioned Christmas is filled with food, fun, and holiday memories from the Stimson family. It’s all tied together with gorgeous photos not only of the food, but also the holiday decorations and beautiful Vermont scenery.The author has included dozens of her own family recipes: Some simple and some a little more challenging (for me anyway) and many accompanied by color photos of the final dish. Recipes for Loaded Mashed Potatoes, Deviled Eggs, and Apricot Horns are calling out to me to be added to the Thanksgiving Day menu. A few dishes I am looking forward to trying are Decadent Mac ‘n’ Cheese, Root Beer Pulled Pork, and Buttermilk Fried Chicken. There is much comfort food here, not only for the holidays, but throughout the cold northern winter.This is much more than just a recipe book. It’s about family and traditions – celebrating old ones and making new ones. I especially enjoyed the seeing the photos of the family’s Christmas ornaments featured in each chapter and reading the stories behind them.This is a book to treasure and one that I will be referring back to again and again. I enjoyed Stimson's first two books, and I was asked to review this one as well. Let me just start by saying that I have a thing for Christmas books. My annual tradition is to browse the aisles at my local bookstore and select one new book to add to my holiday shelf. If you had to select just one book yourself, this would be a good one. I enjoyed reading about Stimson's family traditions, and it made me stop and reflect about some of my own, the things that I look forward to most about the season. Even though it's not my tradition, and I probably won't start it, I liked learning about their annual Christmas Adventure. Richly illustrated and dotted with favorite holiday recipes, and balanced with choice stories about some of their favorite ornaments, each chapter brought delight. Stimson shared the ways that her family celebrates Christmas, not so that we could copy them, but so that we could reflect on and embrace our own traditions. I picked this up in an independent bookstore in Norwich, Vermont and read it cover-to-cover on the car ride home between Vermont and New York City. This was just what I needed after weathering another busy holiday season (actually, I could have really used it before the holidays, but in reality, I most likely wouldn't have gotten around to reading it then). I liked Stimson's basic premise of celebrating Christmas exactly how you want to (If Christmas cards intimidate you, just don't do them! Only invite people you really want to see and who bring a positive energy to your holiday party!) and her intentionally imprecise recipes and her writing. Her recipes were tempting, but doable; her traditions inspiring without being twee. The recipes looked tasty, the layout was beautiful, and the photography was lovely. However, reading between the lines, it sounds like the author is insufferable around the holiday season. I get the same vibe I get from Martha Stewart. Everything is lovely and her food is fantastic, but woe to those who mess up the Christmas of Ellen. Delightful from start to finish. Wished I lived in New England! Absolutely beautiful! The photography, the stories, the recipes...it all brought me to tears! What a beautiful little collection of happy and "hearth-y" family ideas! Ever since watching Bing Crosby sing White Christmas with the Vermont woods as the backdrop, I think has always lingered in my mind as the perfect vision of what Christmas would look like. It's truly my favorite time of year, not just with gift giving, but a time to spend with family and friends, gathered together over a nice meal on a cold winter's night. That is the ideal way of celebrating during this time of the year. Now I have a great book to share with you, An Old-Fashioned Christmas: Sweet Traditions for Hearth and Home by Ellen Stimson. In this beautiful hardcover book, she shares what has been called her families annual Christmas Adventure with readers. Along the way, she passes along some fantastic and mouth-watering recipes from her family who lives, believe it or not right in the heart of Vermont. 98 of them are included in this book along with some nostalgic photos of favorite Christmas ornaments her family has gathered during their life time, along with the story of what inspired that particular purchase. It is the very same thing we all do during Christmas each year, with our own traditions, or recipes making their way to the dinner table or as we unpack boxes of ornaments, perhaps taking a bit of time as we unwrap each one and remember the time and event that inspired that purchase, from a new home, first child or other significant but memorable time from the past. It makes me want to incorporate my own book if you will that I can pass along with my family as our legacy continues long after family members are gone. Some of the traditions captured in Ellen's book are Christmas ornaments. Some members collect what is relevant in their life at the time, while others are drawn to something symbolic about the ornament they choose or a memory that it brings back from a distant time in the past. It's a ritual their family keeps going each year and one my own mother instilled in me, many years ago before I moved out and have since passed along to my own kids. Some of the recipes I can't wait to try during Thanksgiving dinner like, Loaded Mashed Potatoes, Corn Pudding, Eggnog Gooey Butter Cookies, Maple Pepper Bacon, and Sugar Glazed Donuts!! There are simply so many good ones to try I'll be experimenting all through the Christmas season. There are even some dog friendly home made treats so your four-legged friends don't miss out on the fun either! Included in the book are some great Christmas movie and book recommendations as well as places for your family to stay if they want to consider taking a vacation to Vermont during the holiday season and some favorite online retailers that offer New England products that can be delivered to your door just in time for Christmas as well. Truly something for everyone!I received An Old-Fashioned Christmas: Sweet Traditions for Hearth and Home by Ellen Stimson compliments of The Countryman Press and TLC Book Tours for my honest review. I did not receive any monetary compensation, aside from a free copy of this book, in exchange for an honest review. This is a perfect gift to anyone who truly loves Christmas and offers some incredible traditions you might want to incorporate into your family each year depending on where you live. I know for me, this one will be a family favorite for many years to come and has found a permanent place on our bookshelf. I easily rate this one a 4.5 out of 5 stars. Originally posted on: http://www.peekingbetweenthepages.com...An Old-Fashioned Christmas by Ellen Stimson is simply a delightful book to curl up with in your favorite chair and savor page by page and be sure not to forget that all important cup of coffee! Ellen shares with us her family’s Christmas traditions along with delectable recipes and wonderful family tales in a witty and conversational tone. I could picture myself sitting in Ellen’s kitchen enjoying a cup of coffee, nibbling on some of the wonderful cookies she describes in the book, and of course snuggling the furbabies.Ellen lives in a small Vermont town in an isolated mountain home where I think they may quite possibly have even worse winters than we have here and I have to admit all that glistening snow makes for a wonderful Christmas. Ellen most definitely knows how to celebrate the holiday season and in Vermont it seems even more magical with all the snow and sleigh rides. It sounds to me like a magical beautiful wonderland even though I do know how harsh a winter can actually be.Throughout this book we are invited to make new and special family traditions or embrace the ones we already have. Ellen shares many of her family’s traditions with us like their annual Christmas Adventure or buying special ornaments every year for the tree. When she describes all the hustle and bustle of her Christmas with putting up all the decorations and the beautiful tree they put up in the library and all the food and family I must admit to be thoroughly envious. The recipes are wonderful and as I was going through them I was making notes on which ones I intend to make and there are quite a few … Pig Candy, Golden Tassles, Corn Pudding, Cheddar Grits, and many, many more. Even better she even includes a few recipes for dog treats – most definitely a woman after my own heart.I think most importantly the message in An Old-Fashioned Christmas is to keep Christmas in your own way. It doesn’t have to be some huge celebration where you run yourself ragged and barely have time to enjoy a second of it. It should bring you joy. Like Ellen my idea of the perfect Christmas is to be able to curl up with my book and my dog for at least some part of the day. The rest is meant to be spent with family and enjoying all the goodness of Christmas and especially all those special treats that so many of us save for the Christmas season. I highly recommend this magical book of Christmas cheer and wouldn’t it just make the perfect Christmas gift! I think so! I've never really understood the trend of writing stories inside cookbooks because frankly I'm not interested in the first time the author cooked a particular dish or why, I just want the recipe. But, Ellen Stimson's new book, "An Old-Fashioned Christmas" has recipes inside a marvelous and funny story book. And bonus, these recipes look amazing. I am seriously considering doing a "Julie and Julia" type attempt at cooking every dish in this book over the next year. Seriously...I am dying to get to those braised short ribs! I grew up in Michigan and fondly remember those long cold winters where a bowl of stew was magic and a cup of hot chocolate was the stuff of dreams. I now live in Arizona and therefore can only live vicariously through others. Ellen's book makes me long for those days when I would sit on a stool and watch my grandmother cook or bake. I want to put on my fuzziest socks and dance around my kitchen to Christmas tunes as I prepare that decadent macaroni and cheese to go along with the root beer pulled pork. I can almost taste that homemade coleslaw now. Beyond the recipes, Ellen shares her fondest Christmas memories of family, traditions, love, and laughter that surrounded her home and table. And finally, the photography is spectacular. Oh how I long for a horse drawn sleigh ride accompanied by the sun and a thermos full of homemade hot chocolate. Every ornament featured is lovely and reminiscent to my own childhood and the photo of the Christmas tree on page 263 is swoon worthy as that magnificent tree is surrounded by my favorite thing: books! Well done Ellen Stimson on bringing us another brilliant book that makes me long to leave the desert and find my own piece of country paradise. This book was written by a woman who had a lifelong dream of owning a house in Vermont. She realized that dream and is now living the life she longed for in a gorgeous old house. This book is all about winter, Christmas and New Year’s. It celebrates family traditions, food, drinks and love.I found myself lost in the stories – my husband lived in Vermont for 10 years while he was going to college and law school so many of the places Ms. Stimson wrote about were familiar to him. The posts about the weather were very familiar as we have similar here in Montana. I love the first snow and it is indeed cause for celebration. But of course the bulk of the book is about the joy of Christmas.There are so many delicious recipes – what I love about them is that they are not fancy or exacting. They are the type of recipe you hand down from generation to generation. Or at least they seem like they are. There are several I will be trying and if it were a less busy time of year I’d have one demonstrated for you. Hopefully in the next couple of weeks.As much fun as the recipes are the stories told. Even though they are personal stories of Ms. Stimson’s life I felt like part of her family due to her very welcoming writing style. It was rather like sitting around the kitchen table at the home of a very good friend. Truly a book to cherish and enjoy at the holidays and really with the delicious recipes inside – all year round. Ellen, Ellen, Ellen! You have done it again. You still remain one of my favorite, fun authors! I loved this book and want to ask you one quick question...CAN I COME TO YOUR HOUSE FOR CHRISTMAS THIS YEAR? (Just kidding, NOT! )This beautifully presented Christmas book is full of family stories, family traditions, and family recipes all wrapped up in a stunningly photographed coffee table book. You might use it in the kitchen, but in my house...it would be front and center on my coffee table for everyone to see. It takes you through the holiday season with yummy food, decking the halls with Ellen's family traditions, and personal family stories.One thing for sure, ELLEN STIMSON loves Christmas more than you know. In this compilation of everything Christmas, she has put her soul into the writing and I was envious of the good times at her past and present home.I say BRAVO to the Stimson family for all the thought and love they put into the holiday, and all the joy they continue to get from the family, and all the Christmas season brings them.I reiterate...I sure do wish I could come to your house for Christmas. It sounds like it would be great fun, good wine, great food, and in the company of one of my favorite authors...what more could you ask for!! !Thank you for my copy of your book. I highly recommend to all of you. Entertaining, warm traditions, goods times from Vermont. Ellen...you may have lots of company this year. We all want to be there! I love this book! I love the cover, the stories, the recipes and the photos.This is one of the few Christmas-y books I absolutely love. It has a lot of great stories, some touching, some funny, and lots of yummy sounding recipes.I grew up in Ohio where there was usually a lot of snow during the winter, and this book made me more homesick than I already was. I loved reading the stories and didn’t want the book to end.One of my favorite stories was when one of the family members had been misbehaving and they all were feeling bad with colds and a little bit of fever. John got the book SantaLand Diaries by David Sedaris and they all took turns reading while eating cold fried chicken. What could have been a very bad day turned into a day filled with laughs and good memories.This is the first book by Stimson that I’ve read, but I’d like to read her other two books. I like her writing style and her wit, and think I’ll probably enjoy them too.This is a book filled with good memories, good food, and gives you a good feeling. Even if you aren’t a fan of Christmas books, I think you’d enjoy this book for it’s great sounding recipes. If you love the holiday season as much as me then you need to check out An Old Fashioned Christmas by Ellen Stimson! This book is filled with fabulous sounding recipes, memoirs and holiday memories for the author's family. This book is sure to be a fun addition to any Christmas lover's TBR pile.The author shares beautiful pictures of holiday decor and mouth-watering photos of some of her family recipes. Some of my favorite ones I have marked to go back and try are her Citrus Pork Lion, Winter Cranberry Salad and Chocolate Icebox Cake. I plan on even trying a few out for my holiday entertaining this year. The photos of Vermont the scenery are just magical looking and makes you want to curl up with a warm cup of coco, a fire and your favorite throw blanket.I also loved reading about her family traditions and getting ideas for maybe some new traditions for my family as well. You just can't go wrong with this book. It would even make a perfect host or hostess gift during the holiday season.I received an ARC of this book for my honest review and opinion. All ratings and opinions stated are my own. What a charming book!! From the sweet stories and traditions to the delightful recipes, it is a treat to both read and cook from. It made our Christmas even more of a treat. Maple Pecan Cookies are delicious little morsels that keep you coming back for more. The Decadent Mac 'N Cheese has become a family favorite, and is truly decadent with gruyere and parmesan cheeses. Dishes such as Loaded Mashed Potatoes and Cheddar Chive Biscuits will liven up any family dinner, and treats such as Coffee Cream Puffs and Spicy Pecans will be a welcome addition to any party--holiday or otherwise. Your pets are not forgotten, either, with Peanut Butter Dog Treats, Minty Fresh Dog Treats and more for your furry friends.From Cabin Food to Party Foods, Christmas Eve Brunch, Christmas All Day Long, The Next Day and more, your holiday season is covered here. This is a book sure to delight the Christmas lover in you.I received a copy of this book from The Countryman Press for an honest review. All thoughts and opinions are my own. 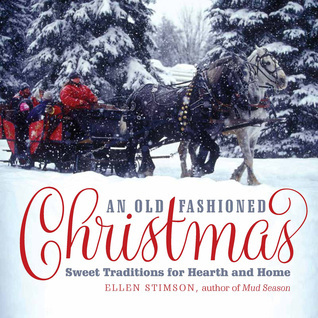 If you are not ready for the Christmas season, you are sure to be after reading Ellen Stimson's new book, "An Old Fashioned Christmas: Sweet Traditions for Hearth and Home." Oh my goodness, this is one yummy book! Not only does Stimson share beloved family recipes that are to die for, she also includes charming stories about her family's holiday traditions. And the photographs that are sprinkled throughout the book are just fantastic. While Stimson is from Vermont and the majority of her stories are based there, this is a Christmas book that can appeal to anyone anywhere who loves the holidays! If you need a little boost to spark the Christmas magic for this year, then this is the book for you! I plan to keep this charmer out handy for the entire season! Thank you, Ellen Stimson, for putting the sparkle back into the season! What a delightful book and it definitely put one in the Christmas mood with the planning , the scenery and just getting together as a family. I loved how the recipes just grew as the family grew in their New England home, it sounded like a dream come true, with the silents, nature and just learning to live with the environment. I loved how the recipes were displayed and the history with it just added more to my imagination and yes, I can hardly wait to try a few or more. Just reading about passing down the recipes from generation to generation caused me to just stop and think about the one's our family uses at each Christmas holidays. Thank you Eileen for a wonderful book that I will revisit again. I love the recipes, many simple and some complicated. I like the simple ones best. One of the easiest is for hot buttered rum. There's also at least one for beef and one for chicken that use a bottle of wine and dark chocolate. Can't wait to try those. I also love the family stories. Having read Ellen's two previous memoirs, this reads as though I'm listening to to a friend talk across the table.I would especially recommend it for families just starting out and thinking about ideas to make their own traditions, for people finding they need to rethink their old traditions, and for anyone who is always looking for new inspiration. If I could gift this to all my friends and family, I would in a heartbeat. Loved it. And the Garlicky scalloped potatoes and sweet and spicy pecans were wonderful. I made two more recipes already from this too. Love a book filled with anecdotal stories and recipes too. Especially good recipes. Ellen shares my love for sentimental ornaments and Christmas traditions. This was a gem to find and read and try the recipes as well! Ellen delivers again! Reading this part cookbook/ park holiday autobiography you can't help but get in the Christmas spirit. I tried one recipe and can't wait to try even more as everything looks so delicious. She does a great job of really bringing you into her life and as always adds a few laughs along the way. I really liked her stories throughout the book with the recipes.